In 1960, Jacques Hurtubise was awarded the Max Beckmann scholarship and went to study in New York for one year. 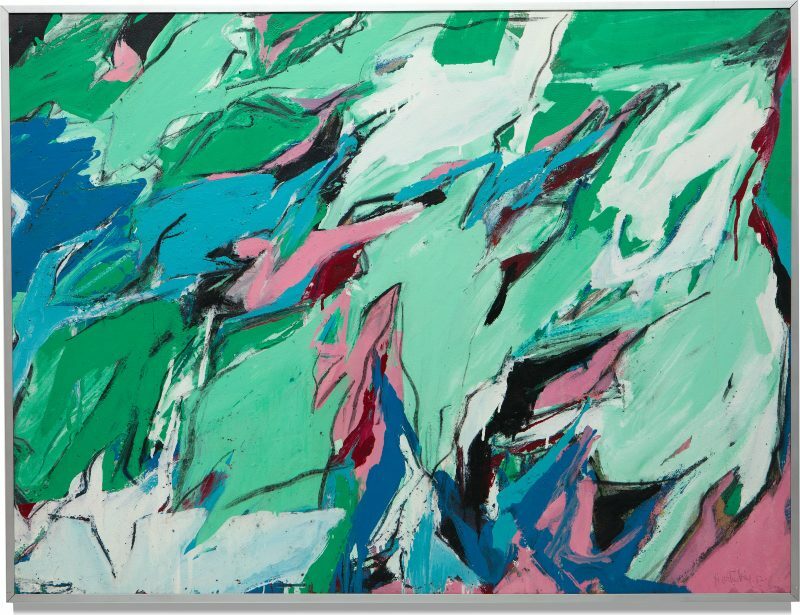 He found many new sources of inspiration there, notably in the work of Malevitch, Pollock, and De Kooning, whose blend of formalism and gesturality would become ubiquitous in his own work. 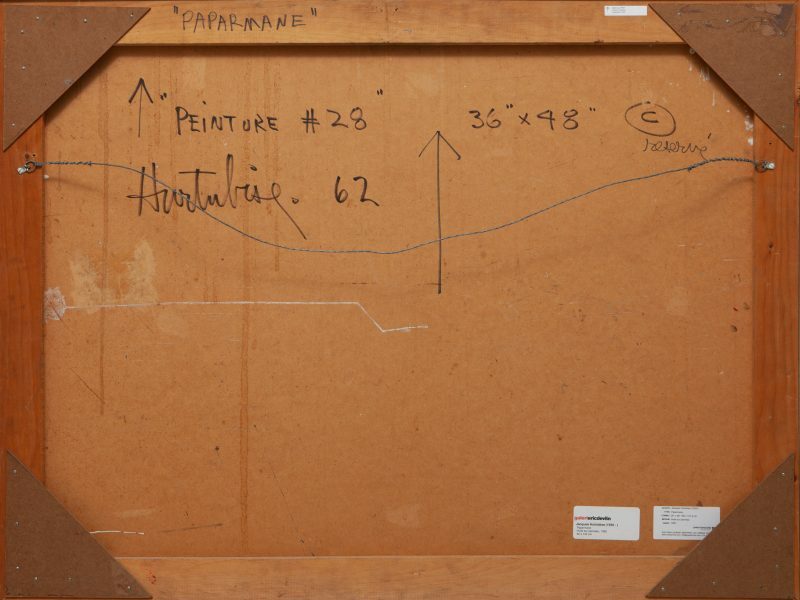 Executed in Abstract Expressionist style, Paparmane stands out for its bold palette—a precursor to the vivid tones that would dominate his work over the next decade—and by the more systematic repetition of pattern lead him to his Plasticien period of the mid-1960s. Here, the pictorial space is sectioned off into juxtaposed and superimposed coloured masses that are underlined in streaks of charcoal. The zigzags and undulations form a diagonal composition that would be at the forefront of his modular paintings in 1977. The title of the work, a play on the word “peppermint,” reproduces the candy’s pastel pinks, greens, blues, yellows, and whites; colours at the “edge of the visible,” writes François-Marc Gagnon, that the painter particularly favoured. Hurtubise was born in Montreal in 1939. Between 1956 and 1960, he studied drawing, sculpture, and etching at the École des beaux-arts de Montréal under Albert Dumouchel and Alfred Pellan, whose influences are recognizable in his work. In 1965, he won the Concours artistique du Québec’s Grand Prize in painting, and in 1967, he represented Canada alongside Jack Bush at the 9th São Paulo Biennale in Brazil. In the early 1970s, Hurtubise had his first touring exhibition, with accompanying catalogue, which travelled to the Musée du Québec (1972) and the Musée d’art contemporain de Montréal (1973). He was the recipient of the Victor‑Martyn-Lynch-Staunton Award in 1993, and in 1998, the Montreal Museum of Fine Arts featured a retrospective exhibition of his work titled Jacques Hurtubise: Four Decades, Image After Image. He won the Prix Paul‑Émile-Borduas in 2000. BRASSARD, Monique, Yvon COZIC et Jocelyne CONNOLLY. Hurtubise sans réserve, Valcourt, Fondation J. Armand Bombardier, 2001. GRAHAM, Mayo (dir.). Jacques Hurtubise : Quatre décennies, image par image, Montréal, Musée des beaux-arts de Montréal, 1998. SHEE, Mary-Venner. Jacques Hurtubise: recent works / oeuvres récentes : February 9–March 15, 1981, Long Beach, The Art Museum and Galleries, California State University, 1981.